I am saddened to report that Chris Ross passed away last Saturday aged 80. His funeral is at Woking Crematorium at 2.45pm on Wednesday 22nd May 2013. Chris is a Byfleet League Legend and was a superb player at both snooker and billiards. His Byfleet record is staggering having won 10 Snooker Championships between 1954 and 1970 and numerous Billiards Championships, 4 times winner of the Billiards Handicap as backmarker, 6 Billiard league centuries topped by a 124 in 1964. His final century being recorded in 1993. He helped his teams win the league on many occasions and was virtually unbeatable at a Thursday night fixture. Outside of the league Chris also had great success and after coming runner up in the 1968 English Amateur Championship he won this prestigious tournament in 1976 defeating Roy Andrewartha 11 - 7 in the final. I was lucky enough to be present to watch Chris defeat Patsy Fagan in the Southern Area Final at the Fishers Club in Acton that year which put him into the all England final. It was a golden era for snooker as Terry Griffiths won the English Amateur in 1977 and 1978 and Jimmy White in 1979. Fagan went on to win the UK Championship. 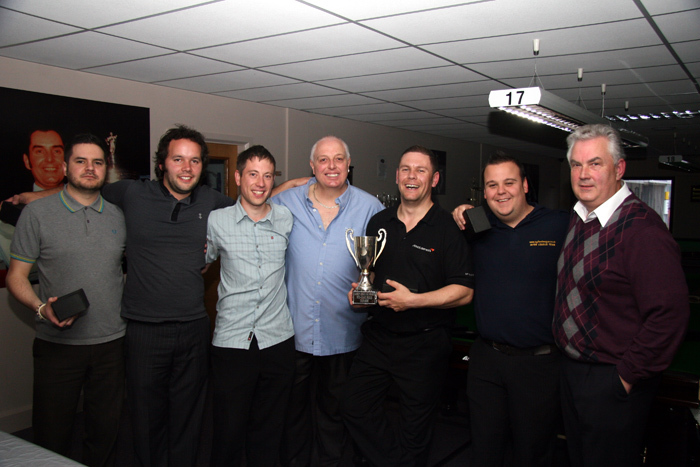 Chris turned pro after winning the Amateurs and toured South Africa with Ray Reardon. In 1977 Chris played in the World Championships in Sheffield. It was the first year that the Championship was staged at the Crucible. In his qualifying round match he had the dubious honour of being on the receiving end of the first century break at the Crucible. Cliff Thorburn knocking in an 111 break in an 11 - 1 victory. Thorburn lost in the final that year to John Spencer. 1980 saw Chris runner up in the Scottish Professional Championship. He returned to the league after relinquishing his professional status after developing the snooker 'yips'. Despite a decline in his overall performances and way below his best he remarkably recorded a maximum break in a match at the Epsom Club. His passion for Billiards remained constant and he was a regular at the Woking Snooker Centre playing weekly sessions against Jerry Conba until shortly before his death. He played many of the greats at both disciplines sharing the table with Reardon, Thorburn, Spencer, Thorne, Mike Russell and other champions. The Byfleet League has been lucky to have had, and does have, some wonderful players, in my opinion Chris was the crème de la crème. His records and cv Our condolences go to his family. Please contact me if you have a personal tribute - email Kelvin Jones at 'Stayingpositive@aol.com'.